The Board of Higher Secondary Education has published complete details regarding upcoming examination to be conducted in August 2014. As per the time table, the Higher Secondary/Technical Higher Secondary/Art Higher Secondary First Year Improvement / Supplementary Examination will commence from 4th August (Monday) 2014. The examination will be conducted in all the examination centers in Kerala and Lakshadweep and in the selected centre in the Gulf countries. Duly filled application forms along with prescribed fee should be submitted to the Principal of the school where the student is studying or have registered for the March 2014 Examination. A passport-size photograph attested by the Principal must be pasted in the space provided in the application form. The application forms will be made available in the school. The last date for submitting the application form is fixed to 27th June 2014. The fee for improvement exam would be Rs 175 per paper while Rs 40 should be paid for the certificate. Candidates who have appeared for all the six subjects at the First Year Higher Secondary Examination conducted in March 2014 can register in this examination for upto three subjects for improving his / her scores in those subjects. Those candidates who have registered for the First Year Higher Secondary Examination, March 2014, but could not attend the examination due to various reasons can register for all subjects for which they were absent. The candidates from Lakshadweep and Gulf countries can submit the application and follow the rules and regulations as prescribed in the notification. The first year higher secondary examination will begin on 4th August and conclude on 11th August 2014. Day 1 starts with English while exams for second language and IT will be held during the afternoon. Exams for the optional subjects would be conducted on 5, 6, 7 and 11 August 2014. 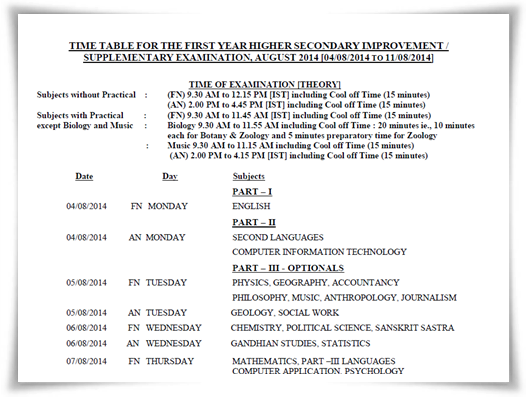 Art Higher Secondary first year improvement exam will be conducted from 4 – 7 August. Students can download the Time Table which can be used to arrange the learning process prior to the examination.